Manufacturers are always trying to distinguish their models so new TV sizes pop up very often, and this model is a great 40-incher, probably the best budget Smart TV on the market right now. Even though Hisense isn’t a household name in the US, this Chinese TV giant is clawing its way up with their new line of Smart televisions. The best characteristic of the Hisense 40H4C is its built-in Roku interface. This is one of the best smart user interfaces on the market, and this TV interface uses simple but handsome design, instead of something complex and flashy. It recognizes different content requirements people are looking for today. With this TV, you can easily flip among a Blu-ray player, a cable box, Hulu Plus, and Netflix and other sources. In addition to the amazing smart functionality of this TV, it also delivers surprisingly great image quality, with solid and pleasing color, amazing shadow detail, and surprisingly smooth motion-rendering even though it has just a 60Hz refresh rate. The overall design of this TV is pretty unassuming but still handsome, with glossy black, slightly curved plastic bezels which frame the chunky screen that is 3.3-inch thick. The remote sensor and indicator light sits on the bottom-right corner, on a smaller protrusion. The TV’s base is a rectangular, flat, glass base which holds the screen steady, but does not let it pivot right or left. The choice of ports on the Hisense 40H4C is typical for a budget HDTV. Optical and 3.5mm audio outputs, an HDMI port, an antenna/cable connector, and a composite video input sit on the screen’s back facing left, whilst a USB port and the two remaining HDMI ports face downward. The downside of this TV when it comes to port selection is the lack of a component video input which limits the TV’s compatibility with some older devices. Also, this screen lacks an alternative to Wi-Fi which is an Ethernet port. The row of buttons is on the screen’s right edge, and it includes Channel Up/Down, Input, Power, Mute, and Volume Up/Down. Hisense took Roku’s simple, oblong remote control and put its own touches on it. A purple direction pad dominates the wand, while Home, Option, Back, and Power buttons sit above this navigation pad, and volume and playback controls sit below. And of course, dedicated buttons for Amazon, Netflix, Vudu and Rdio offer direct access to these four services. This Smart TV puts your streaming channels, favorite broadcast TV, gaming console, and some other devices front-and-center. You no longer have to flip through inputs or wade through complicated menus. 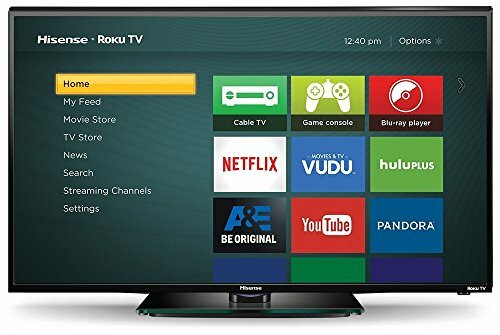 This Hisense Roku TV is extremely easy to set up as well as to use, and you are allowed to choose from more than 2,000 streaming channels, 250,000 TV episodes and movies plus sports, music, international, kids and family, and much more. You also have the opportunity to personalize your home screen with all your favorites put at your fingerprints. Moreover, with Roku Search it is really easy to see what is on, where you can watch it with a subscription, for free, or even how much the channels charge to buy or rent. Not only you can search by title, director, or actor using your remote, but also using the Roku app on your smartphone. Finally, you even have the option to voice search on this Roku TV, and this is a really fast and fun way to find the content you are looking for.